Though they look nothing like ours, roaches do have eyes. Although many parts of a cockroach’s anatomy are fairly primitive, their eyes are quite advanced, giving them almost 360-degree vision of the world around them. Though their eyes possess many remarkable features, they do have some limitations on sight. Cockroach bodies are very flat, rounded on top and protected with thick armor. The eyes rest on top of the rounded head at the front of the body, and because they are nearly on the top of the head -- rather than the front, as in humans, or the side, as in many other mammals -- cockroaches have a near perfect view of what is happening around them. Their eyes are also compound, which means that they contain more than one lens. Unlike human eyes, which possess only one lens, cockroach eyes each have over 2,000 lenses. Madagascar hissing cockroaches, for instance, have 2,400 to 2,500 hexagonal lenses per eye. The huge number of lenses not only ensure that cockroaches have excellent vision, they also make it possible to see more than one thing at a time. Whereas human vision involves seeing just one large picture, cockroaches may form multiple pictures of what is going on around them at any given time. Although roaches do have excellent eyesight, they have some limitations. For instance, their lenses grow progressively more misshapen toward the outer edge of the eye. Lens irregularities can also affect vision in the middle of the eye, though that is less common, and since they have so many, usually not a big deal. Cockroaches also cannot see in red light, though they do see quite well in green light. 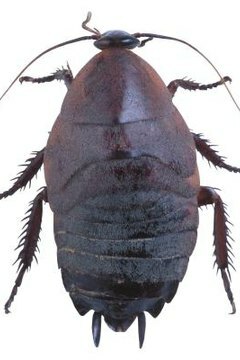 As important as the eyes are, however, it is important to note that cockroaches, unlike most other animals, can live for some time without their heads. Cockroaches have several other senses that they routinely draw on. Their antennae house their scent organs, and males have extra receptors to help them sense female pheromones when females are ready to mate. They also possess two appendages mounted on the underside of their shell, called cerci, which help them sense air currents and other movements around them that protect them from predators. Hairs along their legs perform the same function.